It’s just the end of January and we’re already off to a great start in 2019 and wanted to share with you some of the ways we’ll be helping consumers the whole year long. CUB plans to be as busy as ever providing educational programming across the state to help residential and small business consumers better understand their energy options, save money, and reduce their environmental impact. Check out our events page to see all the public events already planned. Please see our recent blog about how to request a CUB event. Remember all services are free of charge. The legislative session is underway from January 8 until May 20. Our goal is to make sure the interests of residential and small business energy consumers are represented. We also want to maximize opportunities to be proactive and influence positive change for Minnesota energy consumers. Expect to hear regular updates from CUB as we get involved in energy related issues. 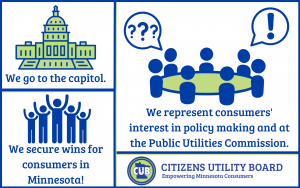 We recently featured a blog that explains all the important things that the Public Utilities Commission (PUC) addresses. Following the various issues (known as dockets) before the PUC, is a big role of our organization. The decisions made at the PUC have a direct impact on the investor owned utility (Xcel, CenterPoint, Ottertail Power, Minnesota Energy Resources, Minnesota Power) rate payers across the state. Our job is to make sure consumer issues are raised and considered in these decisions. We’ll keep you informed about developments. CUB also participates in a number of working groups and studies looking at the future of energy. Some examples include the PUC Distributed Generation Advisory Group, Solar Pathways, the Demand-Side Management Potential Study, and several others. We are very glad to be at the table discussing these topics so that the residential and small business perspective is considered. As you can see, there is a lot of work for CUB in the next year and we’re excited about all the potential for positive impact. We’re grateful for the support of our funders and members to make this work possible. Look for updates throughout the year on all these areas of work. Wishing you a great 2019!